The BM-1 is designed to monitor the performance of 24 volt battery systems with capacities of up to 650 Amp hours. It is supplied complete with a precision 100 AMP shunt and a prefabricated cable assembly to enable simple DIY installation. 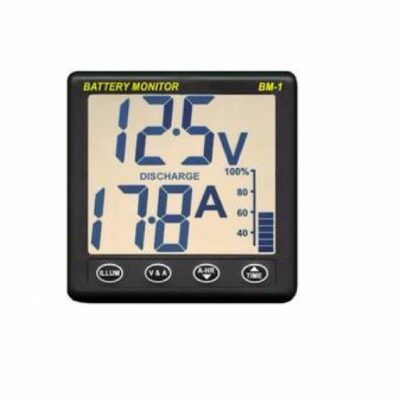 The unit continuously monitors voltage, current (charge or discharge), number of amp/hours (charge or discharge), the batteries state of charge and the time to charge or discharge. 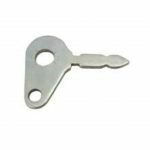 This information leads to more efficient use of the battery, which can enhance battery life and reduce the risk of failure. Cables supplied: 100 AMP shunt link to M8 Ring terminal.5 Metre from display unit to battery – fused and fitted with ring terminals for shunt, fuse holder and M8 ring terminal to battery. Display unit ?Standard 110mm square Clipper case. 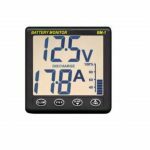 High contrast LCD, backlit for night viewing.Minimum voltage visual alarmSimple operation – 4 keys to select backlight, Volt/Amp/State of Charge screen, AMP hours or Time to run.